A couple of you expressed a desire for a “perfect” leather jacket, which is a tricky request to fulfill, as we all have our own individual ideas about what perfect is. 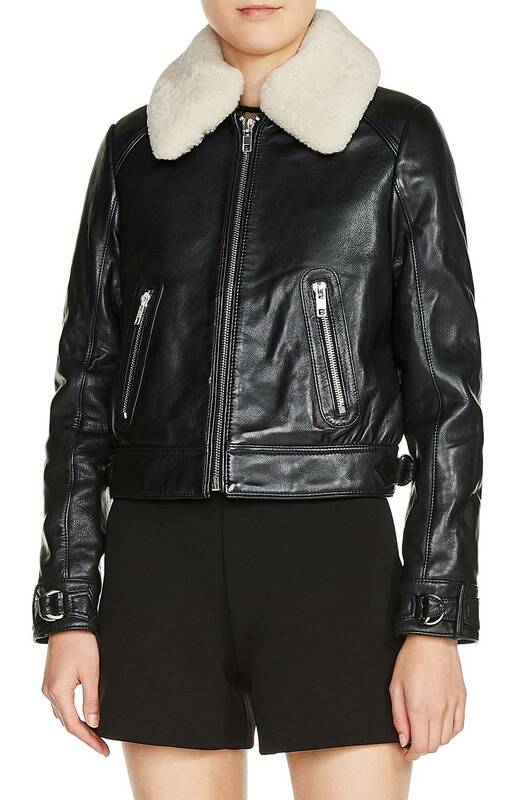 This has also been a tricky post to do because most of the really exemplary leather jackets I find are too pricey for me to feel comfortable posting on GOACA. So all of the following are on sale—some still pricey, but less pricey. And because they are all on sale, sizes are sometimes limited, for which I apologize. My ideal leather jacket is fairly streamlined, with minimal-to-no hardware or ornamentation, so that’s what I’ve included here. 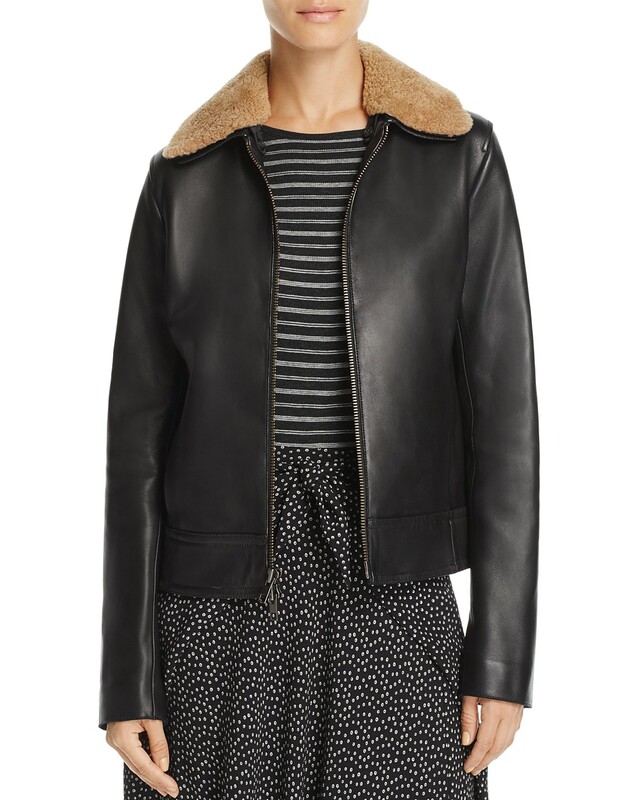 This one from Theory seems thin enough to wear right now under a puffer, which I always think is a good look. 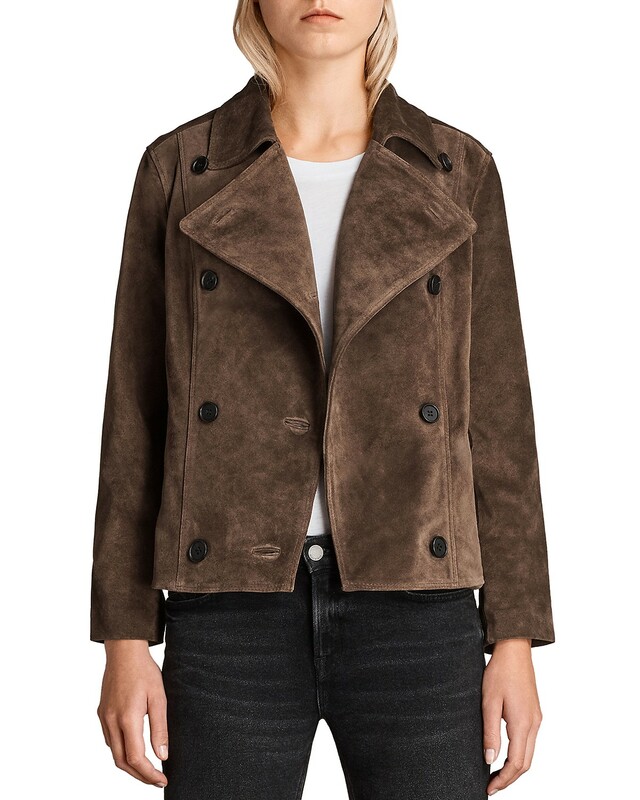 Allsaints makes great leather jackets, and I’m a big fan of this shearling-lined number. The combination of brown and black is underrated. 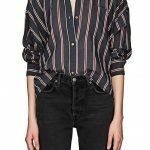 Here is another choice from Allsaints, which I like because it has a certain chic slouchiness, and would look as good with a dress as it would with jeans. Another nicely streamlined option with a nifty snap collar. 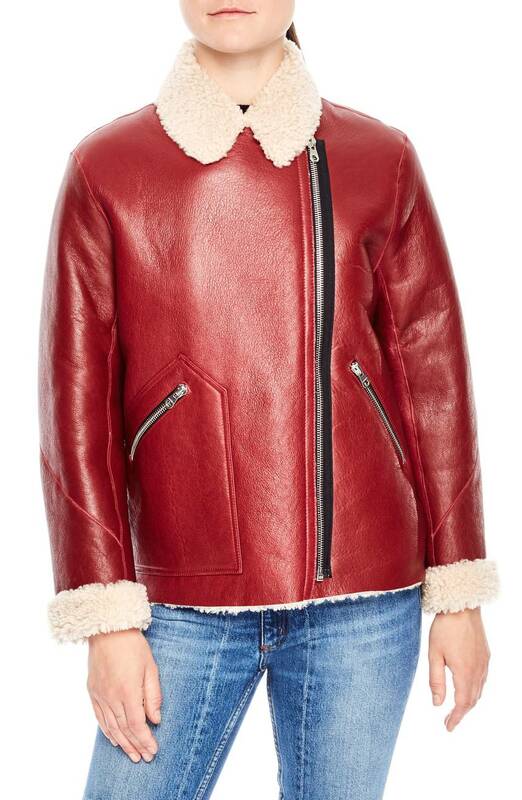 OK, this exceeds the GOACA price limit even marked down, but there is something so fun about red leather, and it’s lined in shearling so it’s warm, warm, warm. I’m pretty sure I think this is just classic and perfect. Cropped and cute, with a great furry collar. 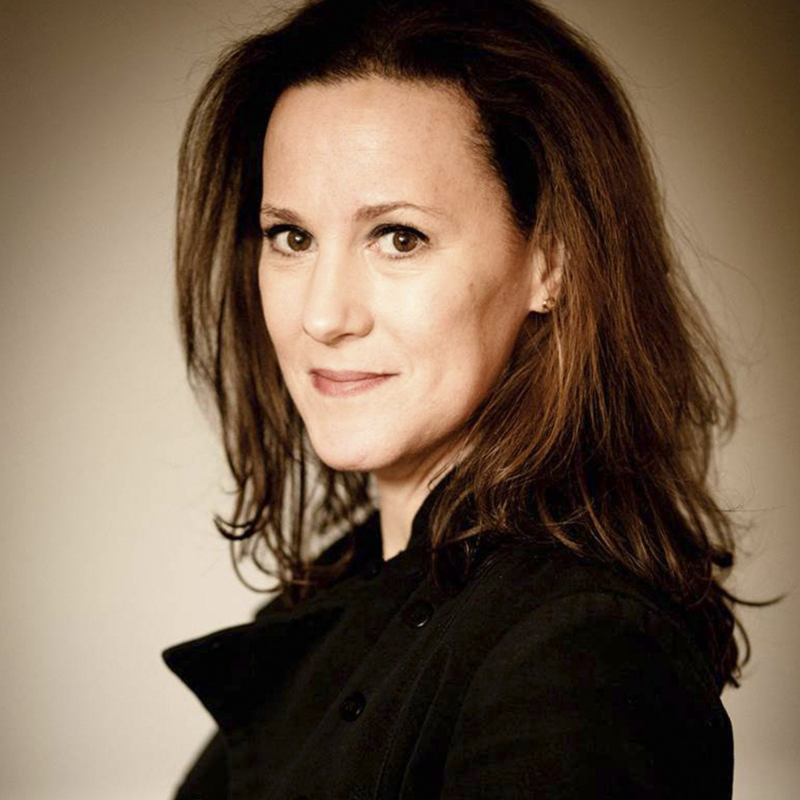 A dark green leather jacket is a very stylish and unpredictable thing to own. This one from Vince could not be a whole lot more perfect in my book, and I like the ever-so-slight sheen of the leather. And this little cutie is suede so it doesn’t quite fit with the category, but it’s so damn adorable I had to include it. id love to see what you would pick up from target/old navy/HM, and other lower end stores? thanks for the daily inspiration! Unsolicited update – Still going strong at hour 5! And on chapped winter lips, no less. Unsolicited update - Still going strong at hour 5! And on chapped winter lips, no less. Emerson Fry just released another run of their biker jacket. I missed it last year so I think I’ll bite this time! Emerson Fry just released another run of their biker jacket. I missed it last year so I think I'll bite this time! I like that one a lot. I also like one from the Arrivals. I have really hesitated to buy a pricier jacket because I just don’t know the “one” with which I’d be satisfied and I’m trying so, so hard to just buy fewer, higher quality, fairly-made pieces. I just took a bunch of stuff, including a Coach leather jacket, to the WEAVE shelter clothing store here. Felt good, but I’m afraid I’m too afraid to know what the right jacket is??? 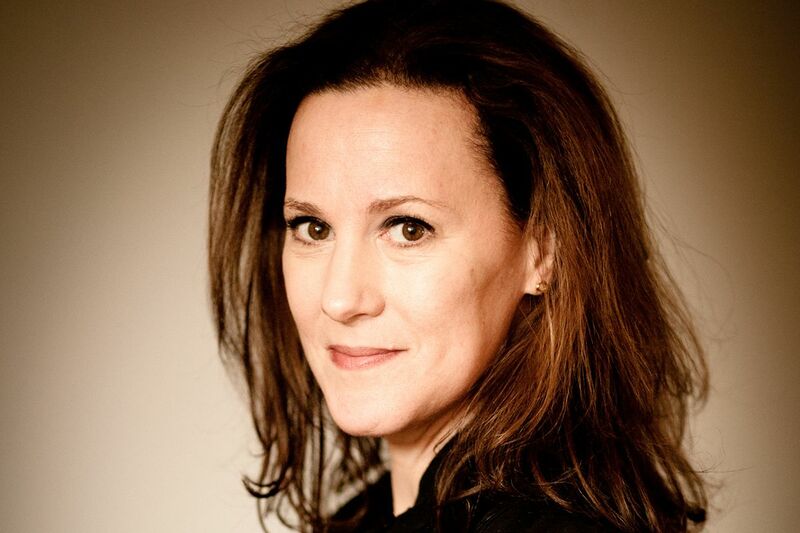 I go for the same look, Dana…simple and classic is better. Look at Oak.com for a few well-priced good ones. I go for the same look, Dana...simple and classic is better. Look at Oak.com for a few well-priced good ones. Yes, this Emerson Fry one deserves real consideration. Black linen is just slightly smarter/more original than everyone-has-it-already leather. Sharon, I bought it last year and I love it. Hurray, you’re back! Hope you had a good trip! Hurray, you're back! Hope you had a good trip! Yes! Happy New Year to you and everyone here! That second AllSaints one is perfect and the price is really good. Birthday present for myself on the way! That green one is gorgeous and I’m totally coveting it—but I have a weirdly long torso and need things a bit on the long side even to appear like a regular cropped length. Does anyone know how long that RL jacket is, or where to find ones that fit long torso-ed peeps like me? I buy Lauren jackets as they fit me well, and I am short waisted. 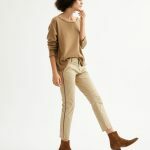 I have a tweed moto from them and it hits me just below the waist – so I don’t think it would be long enough for you 🙁 Their sizing is pretty consistent. I buy Lauren jackets as they fit me well, and I am short waisted. I have a tweed moto from them and it hits me just below the waist - so I don't think it would be long enough for you :( Their sizing is pretty consistent. Thanks for the info, @Suz. Super helpful. Thank you for this post, Kim! 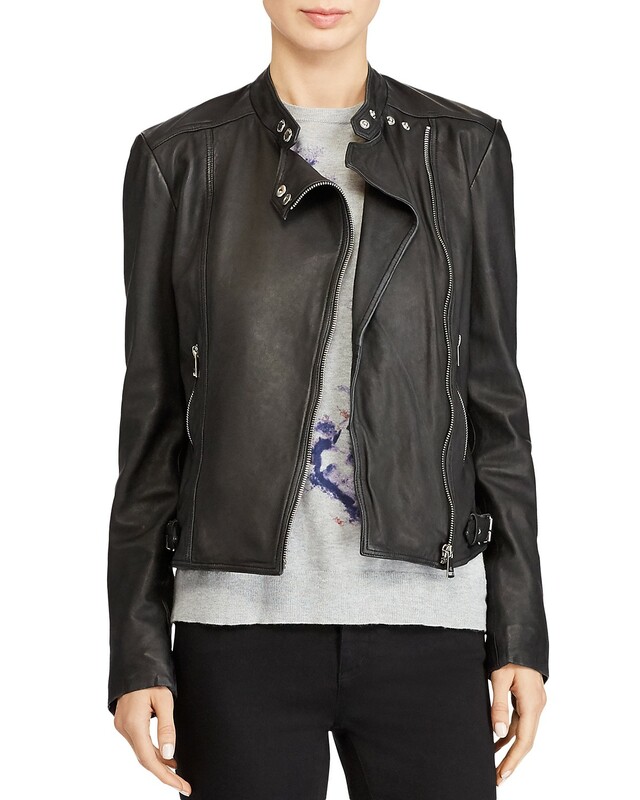 Leaning toward the AllSaints (2nd one). Love the Instagram photos of your trip, Kim. Looked as though you had a smashing and relaxing time! Thank you for this post, Kim! Leaning toward the AllSaints (2nd one). Happy New Year one and all. Love the Instagram photos of your trip, Kim. Looked as though you had a smashing and relaxing time! Ordered the 2nd one from AllSaints plus another one from AllSaints that is similar, but different. I’m confident that one or the other will win out. Ordered the 2nd one from AllSaints plus another one from AllSaints that is similar, but different. I'm confident that one or the other will win out. Isabel Marant Kady or Bacuri … on Ebay, $300-400 max is what you should pay. 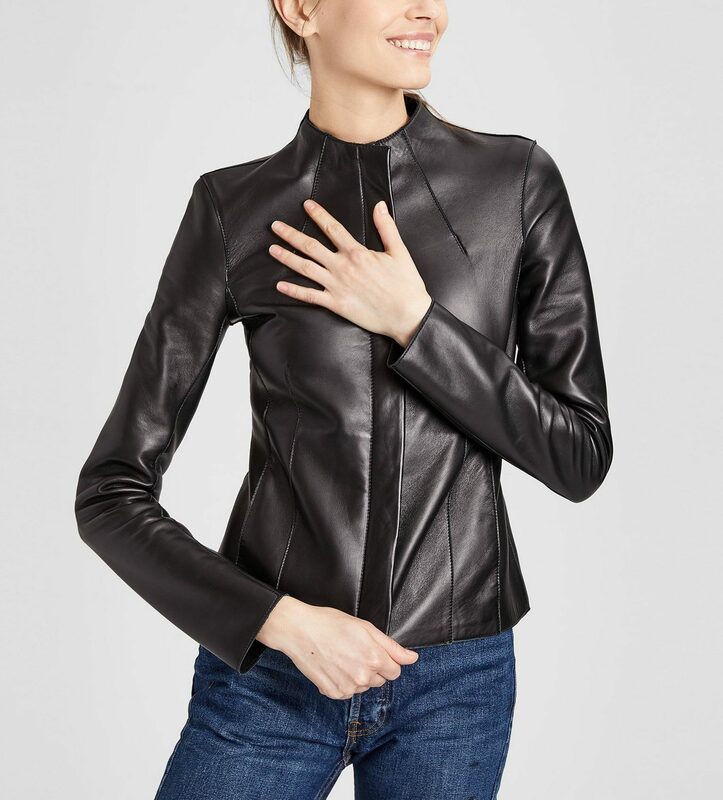 I finally got one (black Kady) earlier this year, wear it all the time, lots of compliments, glad I made the plunge (never thought of myself as a leather jacket kind of person). Isabel Marant Kady or Bacuri ... on Ebay, $300-400 max is what you should pay. 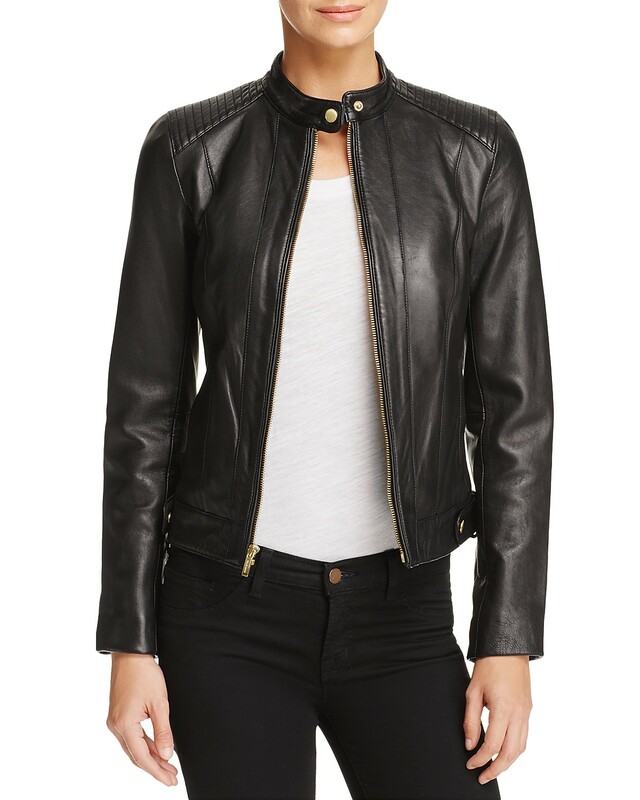 I finally got one (black Kady) earlier this year, wear it all the time, lots of compliments, glad I made the plunge (never thought of myself as a leather jacket kind of person). The Kady is perfect, a classic. so money very well spent! Oh, you are killin’ me. Am trying to justify buying the Ralph Lauren one, as yes, it’s perfect. Nice lack of too much metal all over the place. They really do get jackets right, regardless of the preppy heritage. Oh, you are killin' me. Am trying to justify buying the Ralph Lauren one, as yes, it's perfect. Nice lack of too much metal all over the place. They really do get jackets right, regardless of the preppy heritage. 1) I have a dark green motorcycle-style jacket (in suede), and I get compliments every time I wear it. It’s a very cool alternative to black. 2) That said, nothing really beats Rick Owens (the leather on those things is gorgeous), although they are way over the GOACA price limit new, but it’s fairly easily to find them on TheRealReal and other places for $400-$600. I bought one secondhand, but of course I got a little chubby so it’s a little snugger now than I’d like. Sigh. 1) I have a dark green motorcycle-style jacket (in suede), and I get compliments every time I wear it. It's a very cool alternative to black. 2) That said, nothing really beats Rick Owens (the leather on those things is gorgeous), although they are way over the GOACA price limit new, but it's fairly easily to find them on TheRealReal and other places for $400-$600. I bought one secondhand, but of course I got a little chubby so it's a little snugger now than I'd like. Sigh. i agree on the Rick Owens & am laughing about your chub comment. my RO jacket is definitely an effective way to keep me from excess, there’s not much buffer zone with the way he cuts the sleeves & torso. i agree on the Rick Owens & am laughing about your chub comment. my RO jacket is definitely an effective way to keep me from excess, there's not much buffer zone with the way he cuts the sleeves & torso. Your example made me agree: brown and black is definitely an underrated combo. Great find! Coming from one of the requesters — thank you for this! So many good options to consider (including in the comments). The post made my evening. I would make a request, except I am pretty sure what I want doesn’t much exist. I’m looking for a citified platform ankle boot that is a 2 inch heel and 1 inch plat (more or less). There are very few and I haven’t found one that looks nice enough. Also, I like how suede looks but it doesn’t wear if you drive, which I have to do. I am one of those people who are picky but keep things forevvvver. I actually went into the All Saints store yesterday after reading this, tried on the shearling jacket and left, only to return 30 minutes later and bought it! I’m glad I did because it’s already out of stock in all sizes. Purchased just in time for this crazy snow we’re having here in NYC! 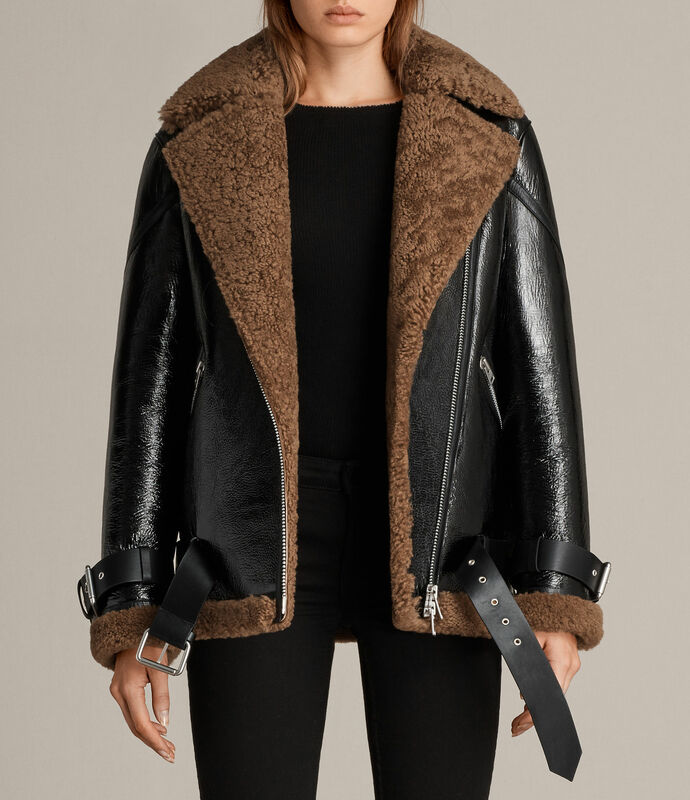 I actually went into the All Saints store yesterday after reading this, tried on the shearling jacket and left, only to return 30 minutes later and bought it! I'm glad I did because it's already out of stock in all sizes. Purchased just in time for this crazy snow we're having here in NYC! Thanks, Kim! These are pretty perfect, if you ask me. 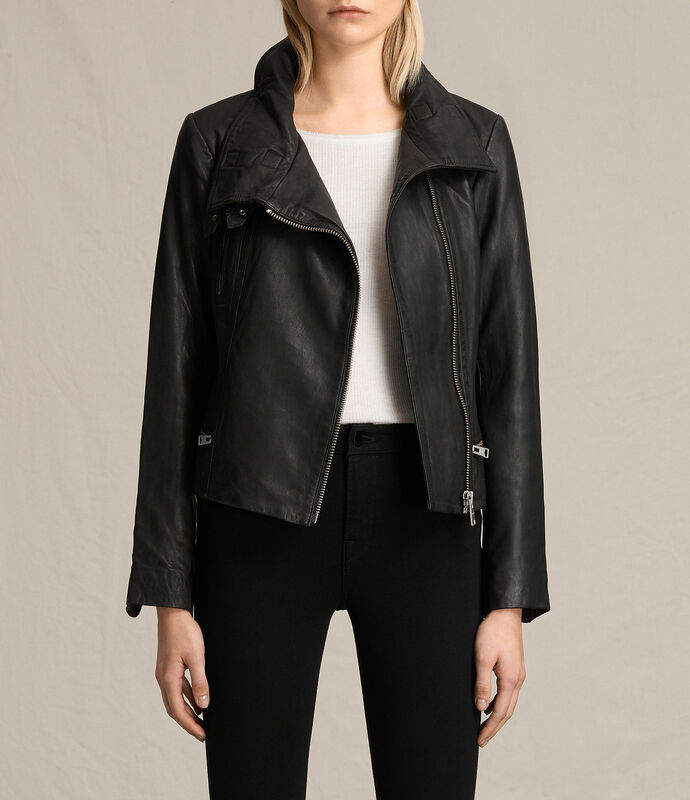 I really love the classic biker look, but without all of the bells and whistles, so the Bales by All Saints, and the Lauren Ralph Lauren are just the ticket. And as a “fun” extra, the green one is GORGEOUS! 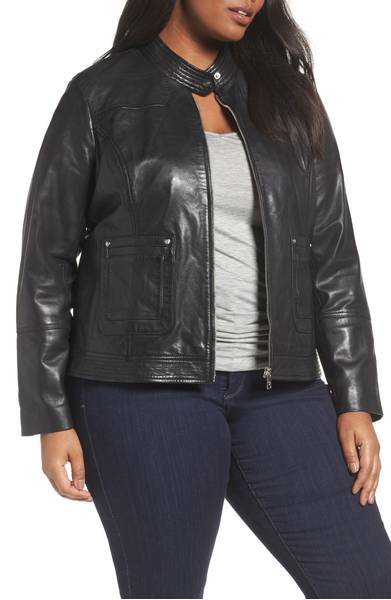 OAK has a good one in black leather for Misses as well as plus sizes if one is searching for a “biker jacket” look.